Home / Unlabelled / The Economist : Atiku Was Singled Out By America’s Senate On Corruption & More. The Economist : Atiku Was Singled Out By America’s Senate On Corruption & More. AND then there were two. 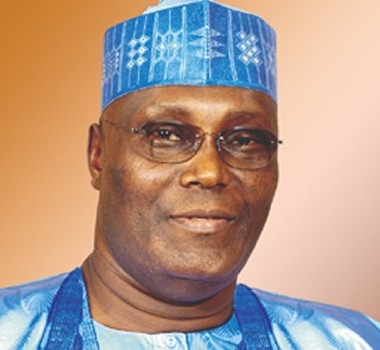 After a long night of intrigue and counting in primary elections in Port Harcourt, the People’s Democratic Party (PDP), Nigeria’s main opposition, chose Atiku Abubakar as its presidential candidate for the elections in February. At the same time, the ruling All Progressives Congress (APC), more predictably, unanimously backed the incumbent, Muhammadu Buhari, for a second term. Both candidates are boringly familiar to voters. Mr Abubakar has been in every election since 1999; Mr Buhari every one since 2003. Oddly for a country where half the population is younger than 18, both candidates are in their 70s. Both face the challenge of energising an electorate that is growing disenchanted by extravagant promises that bring little change. Equally striking is that both are northerners, Muslim and belong to the Fulani ethnic group. That ought to be of little consequence. But it counts for much in a country where people often vote along ethnic and religious lines, and where parties usually ensure that candidates from the north and south take turns standing. For all their outward similarities, the two are quite different characters. Mr Abubakar, a wealthy former vice-president and customs-service chief, is a politicians’ politician, a gregarious character who masterfully outflanked his rivals in Port Harcourt. He campaigns as a business-friendly candidate who will get Nigeria’s economy going. By contrast President Buhari, austere and introverted, is a former military ruler who does not hurry to make decisions and is suspicious of Nigeria’s corrupt political and business elite. Mr Buhari’s aides say his administration can claim successes in the fight against jihadists in the north-east and in diversifying the economy away from its dependence on oil, which once accounted for 90% of government revenues. Corruption is likely to be a prominent issue. Mr Abubakar was singled out by America’s Senate in 2010 in a report on money laundering. It said he had channelled substantial funds of uncertain origin into America through proxy accounts. Mr Abubakar is backed by Goodluck Jonathan, a former president under whose chaotic rule between 2010 and 2015 corruption proliferated. Mr Abubakar’s supporters note that their candidate is the most investigated politician in Nigeria’s history, and that no charges have ever stuck. Mr Buhari’s extraordinary victory in 2015 challenged the long-held view that it was impossible to unseat an incumbent in Nigeria. A key to his success was his ability to hold together an awkward coalition of parties to defeat Mr Jonathan. To repeat the trick, Mr Abubakar will need to win the full-throated support (and financial resources) of rivals he has just trounced for the nomination. Mr Buhari’s challenge is different. Although his nomination was uncontested, the party has been tearing itself apart over which candidates will run for state governorships and seats in the senate. The first lady, Aisha Buhari, said on Twitter that some of the APC’s primaries had been rigged. She criticised party managers for sanctioning a culture of “impunity”. Her husband will need to impose discipline on the party. Turnout in 2015 was just 43%. In more recent state elections it dropped to 20%. In a system where the party machinery is needed to turn potential support into actual votes, it is the battle within that may determine the outcome of the presidential election.